Levi cannot help but like KinderBach. When we reviewed the online lessons (here) last year, he was hesitant for about 5 minutes. Then, he would daily ask me to sit and do Kinderbach with him. Even on weekends. Having purchased a iPad this fall, I asked if he’d like to try the Classroom version of the KinderBach app. He hesitated for a minute (He’s a cautious boy), then said, “Sure,” and he’s never looked back! 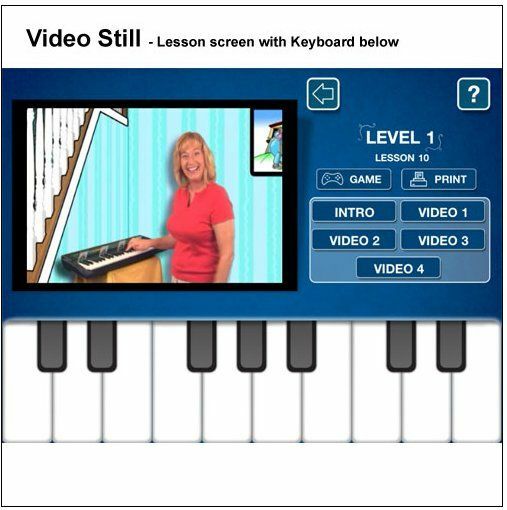 KinderBach is a system of teaching basic piano and music skills to young children (ages 3-7, but it may even appeal to slightly older children as well) developed by Kerri Gregor, who has the perfect personality for teaching this aged child. She has a great way of relating to the kids that keeps them engaged and listening. 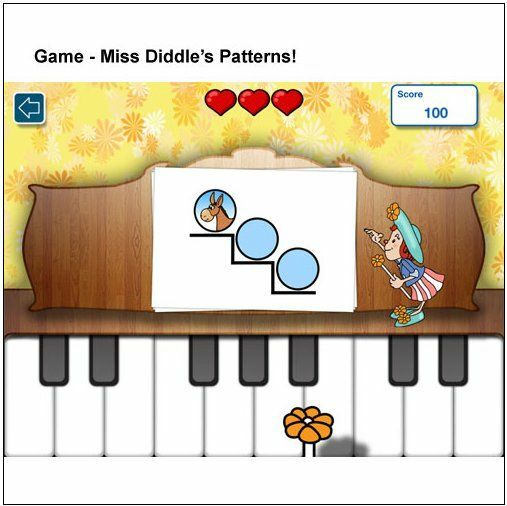 The classroom app contains the first three levels of the Kinderbach curriculum (which you can view here), which will include skills such as learning the basic layout of a piano keyboard, learning note values of quarter notes and half notes, learning note symbols (an animal stands for each note: A donkey for D, an eagle for E, etc.). Proper hand and key position and simple note reading is covered as well. By the end of this series, your child will be able to read the basic notes of the C scale! Each of the three levels has 10 lessons. In each lesson, there is a short introductory video, which explains what skills your child will learn and practice. Then, there are 4 videos which teach the child skills. In the picture above, you can see easy links to the games and print pages for the lessons (you need an airprint compatible printer). The “?” takes you to a FAQ page on the website. The website says that there are enough lessons – utilizing 150 videos -- for a year’s worth of music training, but honestly, Levi loves it so much that I’m not sure it would last a full year! The classroom app is available at the iTunes store for $26.99. This is a great value, because you can use it over and over with all the kids in your household. What I really appreciated about the app was that it had a mini-keyboard on it. We do not have a keyboard right now, so this helped Levi to apply the skills he was learning conveniently on his lap no matter where we went. We have a wi-fi only iPad. Video lessons are downloaded the first time you play them not at point of purchase, so before you hit the road with the app, you might want to make sure you’ve downloaded the lessons you want to use. We’ve had no issues with this being a problem, however. Honestly (because that is what you get here), I do not “push” KinderBach on Levi. I use it as an adjunct to our school day, and it is something that I will remind Levi about occasionally, but he usually remembers to ask to play it on his own. I feel like I guide him enough on certain subjects, and decided to let him be in charge of what he works on with KinderBach. So far, this casual, child-led style has worked with KinderBach. It helps that the program is broken down into Levels, then lessons, then videos. Levi is a fairly linear thinker at this stage, so he enjoys progressing sequentially through the program. He usually watches one or two videos in a sitting, and then (since the games are his favorite) plays a game. Some days, all he plays are games. And I’m OK with that. I’m not planning on him becoming a music prodigy – but I do hope he grows to appreciate music and enjoy it. I should add that the app has a link to online coloring page and games to download and print out. Levi hasn’t been interested in these at this point. Some basic pages are free, while others have a small charge. You can see the supplemental pages and their prices at the KinderBach Extras page. I still love Kinderbach, and I’m so happy Levi likes it still, too. The app will remain as a part of school for the rest of Levi’s first grade year. I noticed last year that Levi does not seem to possess an innate skill for rhythm, so I’m hopeful that he’ll learn this (at least) by the end! I love the app interface and only hope for two new additions with future upgrades: a place to “bookmark” where you’ve left off on lessons and the ability to set up multiple users so that more than one child can keep their place in the game, as well as keep their score separated. Oh, and one other upgrade: more levels and lessons, pretty please! If you have young children and you’d like to begin integrating some music education into their day (whether you homeschool or not), Kinderbach is a great starting point. Disclaimer: As a member of the TOS Crew, I received a free download of the Classroom version of Kinderbach, at no cost to me, in exchange for my honest review. All opinions are mine.